After having two domestic violence cases hit the Internet and Wanderlei Silva blasting them in his retirement announcement within the span of an hour on Friday, the UFC quickly attempted to redirect fans’ attention towards some positive news. As expected, the heavyweight shootout between former champion Junior dos Santos (pictured) and Stipe Miocic will go down at UFC on FOX 13. The 265-pound affair will headline the freebie fight card. The December 13 event takes place inside US Airways Center in Phoenix, Arizona. They were initially slated to meet at UFC 173, but the fight got pushed back one week later to headline The Ultimate Fighter Brazil 3 Finale after that show’s original main event was postponed. However, dos Santos was subsequently forced to pull out of the May card with a hand injury. Miocic went on to plaster Fabio Maldonado that night instead. This bout marks dos Santos’ first scrap since getting steamrolled by reigning champ Cain Velasquez for the second time in three outings last October. 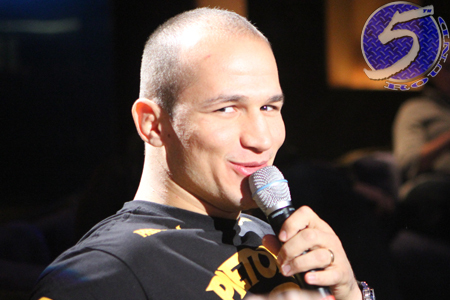 Despite his inability to solve the Velasquez puzzle of late, after knocking Velasquez out in 64 seconds in their initial encounter to capture the crown, “Cigano” remains the second best heavyweight in the game. Miocic has rattled off three straight wins. The Croatian has quietly compiled a 12-1 professional record, with his lone blemish coming to Stefan Struve in September 2012. FOX will broadcast the main card live starting at 8PM ET/5PM PT.